Not many things stick out in my mind more than the classic, giant soft pretzels we used to beg mom for on every visit to the mall. As I got older many of my tastes changed, but the pretzel was one thing I’d never lose the craving for. Garlic, cinnamon, jalapeño, or almond, all made right in front of you. Bathed in butter and dusted with salt, fresh out of a piping hot oven, nothing beats a good soft pretzel. A few weeks ago it dawned on me: “We should try these in the pizza oven!” With a few good recipes and an eager new intern, I set off to discover if it was possible. What Goes into Making Pretzels? 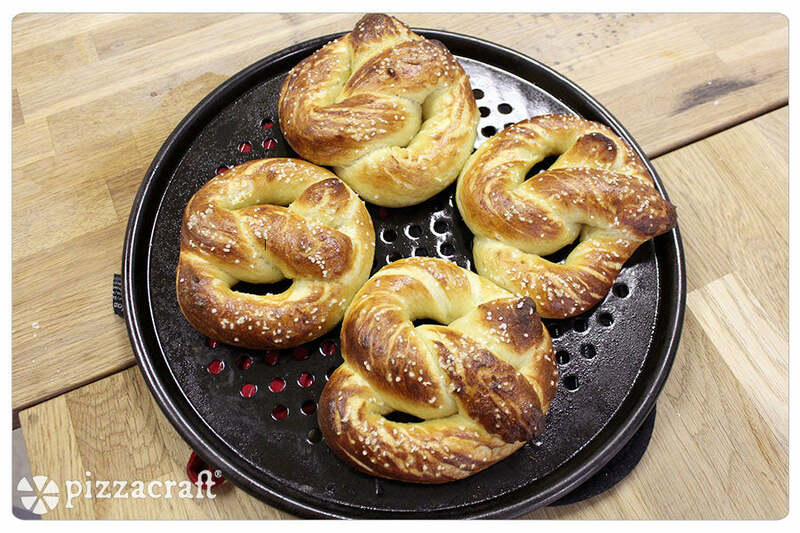 Most of the magic that is a fresh-baked soft pretzel can be attributed to a special technique applied to the dough before baking. A special bath is prepared to boil the pretzels using baking soda and water. Why baking soda? Because it promotes browning, allowing for the perfect texture inside and a chewy, shiny skin on the outside. In this bath, each pretzel takes a 30-second preliminary dunk before being transferred to a baking pan and put in the oven. Microwave butter on high for 20-30 seconds until fully melted, set aside. 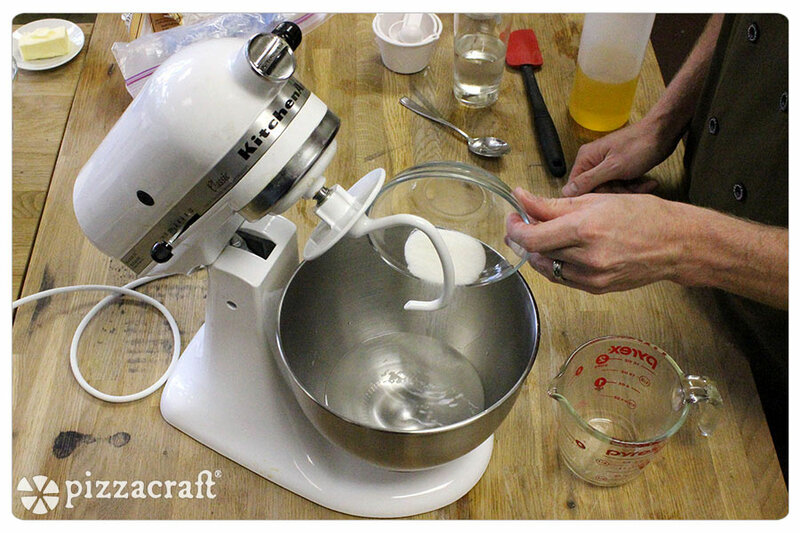 Place water, sugar and yeast into the mixing bowl of a stand mixer. Using a whisk, gently mix the water, sugar and yeast until combined. Let this mixture stand 5 minutes so that the yeast can proof. Put the flour and salt into a medium-sized bowl and whisk until combined. When the yeast becomes foamy, add the flour and melted butter. With a hook attachment, mix on low speed until a rough dough forms. When the dough has formed, increase mixer speed to medium and mix 4-5 minutes until it lifts completely from the sides of the mixing bowl. Remove the dough from the mixing bowl and place on a greased cookie sheet and cover completely with a clean towel. Allow dough to double in size before cutting (approximately 50-60 minutes). When the dough has nearly risen, put the stockpot of water on the stove and add the baking soda. Bring to a boil. When the water is boiling, cut the batch of dough into 8 pieces. Take each piece and roll into 24” long ropes, approximately 1/2“ thick. Take each rope and form a U-shape, cross right side over left, and twist. Bring the twisted end down and press gently onto the curve of the U to form the pretzel shape. Boil each pretzel in the water bath solution for 30 seconds and place them on a sheet tray. Brush each pretzel with the egg wash and sprinkle with pretzel salt. Place 3 pretzels on a well-greased pizza screen (a non-stick porcelain screen works best) and bake 6-8 minutes until a shiny dark brown crust forms on top. 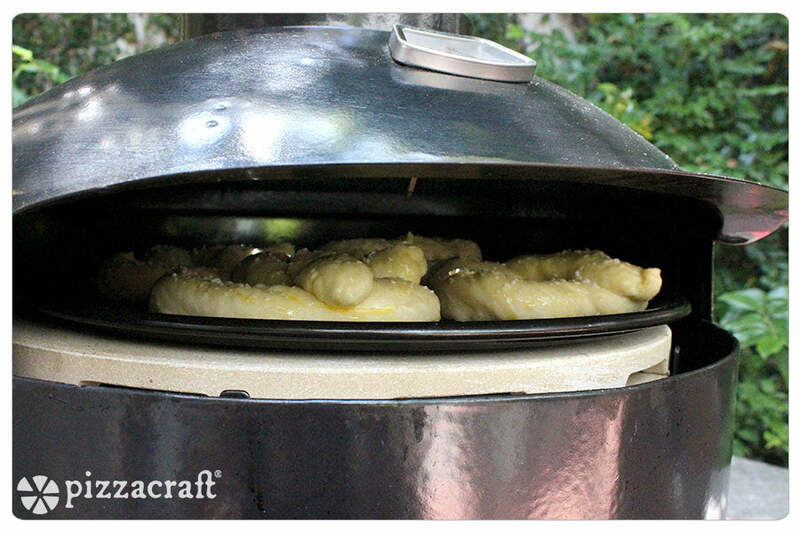 Be sure to rotate the pretzels at least 3 or 4 times before they finish cooking to promote even browning. Remove pretzels immediately with a spatula and set on a rack to cool 2-3 minutes. Let us know what you think once you've tried cooking pretzels in the Pizzeria Pronto! Tagged How To, Pizza Ovens, Pretzels, Recipes. The dough recipe worked well. I had already got food grade lye so used that for the dip. However, I think you are missing “cup” for the amount of water in the recipe (I guessed). Also, what temp for the oven? We tried on high, as for pizza, and the bottoms burnt. Any help there appreciated.